The executive of the Hellenic-Cuban Friendship Association and Solidarity (AHCAS) visited nearby the famous Acropolis from there to demand the unconditional release of the Cuban Five Heroes. The action included the distribution , to the hundreds of tourists visiting the Acropolis daily, a statement denouncing the injustice committed against The Five and demand the immediate release of the Cuban Heroes, and the lifting of the criminal blockade imposed on Cuba by the USA. For the past 15 years five Cuban patriots have been held in US prisons for the sole reason that, based on specific facts, they uncovered sabotage, the planting of bombs in hotels etc. being planned and orchestrated by anti-Cuban organizations established in the US, enjoying US state support. Sentenced to serve lengthy prison terms on the basis of false charges at a trial that was a travesty of justice, as no evidence was provided to back up the accusations. These patriots are Gerardo Hernández, René González, Ramón Labañino, Fernando González and Antonio Guerrero. Only René González has been released, having served his sentence and returned to Cuba, where, together with the Cuban people, he is struggling to obtain the immediate and unconditional release of the others. We protest their unacceptable conditions of detention, the fact that they are forbidden to or hindered from meeting with their families and lawyers and the attempts made by the US authorities to break their morale. We demand their immediate and unconditional release and return to their homeland. We demand that the economic, commercial and financial blockade imposed on Cuba by the USA be lifted and that the “Common Position” of the European Union to the detriment of Cuba be abolished. We stand by the side of the Cuban people in their struggle to live in a sovereign country and to build a society with free healthcare, education, sport and culture for the entire people. Havana.- Nearly 100 Latin American patients have received services at Cuba''s National Rehabilitation Center for the Blind and Visually Impaired, it was reported during the 7th Congress of the National Association for the Blind and Visually Impaired, which ends Thursday in the Cuban capital. Those 100 were part of more than 1,600 blind and visually impaired people who have been served at the center in the city of Bejucal, in the western province of Mayabeque, according to the association's president, Dr. Jose Blanch. Blanch highlighted Cuba's achievements in integrating blind and visually impaired people into society with actions such as the Braille literacy campaign, which has benefited more than 4,000 people. He also highlighted the creation of special schools in all regions of the nation, and continuing education for visually impaired Cubans, as evidenced by a growing number of university graduates in careers such as psychology, law, and physical rehabilitation, among other. Meanwhile, during the final day of the Congress, the Latin American Union of the Blind will grant the Cuban association a special recognition for its achievements and contributions to other countries of the region. Havana, (Prensa Latina) The refusal of M&T Bank to continue providing services to the Cuban diplomatic missions in the United States has also affected the office of the Prensa Latina Latin America News Agency based at the United Nations. Since March 2010, the bank has held the account for the Prensa Latina office at the headquarters of the world organization in New York, where the agency has worked for more than five decades. However, on July 12, the agency's correspondent received a letter signed by Peter Senica, vice president of M&T Bank, headquartered in Baltimore, announcing the decision to "close the division that provides services to diplomatic entities and all related accounts, included that of employees and relatives." Headquartered in Havana and nearing its 55th anniversary, Prensa Latina is recognized worldwide as an international news agency specializing in Latin America and the Caribbean, with 30 offices worldwide. It is also a founding member of the Latin American Union of News Agencies and has been an active participant in the context of the World Congress of News Agencies, the most recent of which was held in Saudi Arabia this month. The Prensa Latina representation at the U.N. renewed and received in January this year, a special license granted by the Office of Foreign Assets Control (OFAC) of the Treasury Department, effective until 2015. That document, framed as "regulations of Cuban assets control" (blockade), authorized M&T Bank to "open, maintain, and operate the account on behalf of Prensa Latina," "solely to cover its personal expenses." Three days ago, the Cuban Interests Section in Washington denounced "the existing restrictions resulting from the U.S. Government's policy of economic, commercial and financial blockade against Cuba." HAVANA, Cuba, (acn) The members of the National Association of the Blind (ANCI) gave on Friday the Baston de Cristal award to Army General Raul Castro, president of the councils of State and Ministers. The ANCI gave the Baston de Cristal to Army General Raul Castro during the closing ceremony of its 4th Congress, which was received by Salvador Valdes, member of the Politburo and Vice-president of the Council of State, the Granma newspaper reported on Friday. Also during the closing ceremony, Jose Blanch was ratified as president of the National Council of the ANCI, while the Latin American Association of the Blind (ULAC) gave the Cuban organization the Enrique Elizalde award for its notable work, already turned into a referent for the region. Cuba’s achievements in the reincorporation of blind and visually impaired persons into society as well as in rehabilitation were highlighted in an inclusive interview with ACN by Brazilian Volmir Raimundi, president of the ULAC, who attended the Congress. HAVANA, Cuba.- (acn) The Latin American Association of the Blind (ULAC) gave on Thursday in this capital the Enrique Elizalde Award to the National Association for the Blind (ANCI), for the notable of this organization, already turned into a referent for the region. The achievements of the Caribbean island in terms of the reintegration of blind and visually impaired persons into society are part of this work, highlighted Brazilian Volmir Raimundi, president of the ULAC, during an exclusive interview with ACN. Raimundi participated in the 7th Congress of the ANCI, which wound up on Thursday, attended by over 200 delegates from around the country. The executive also underlined the incorporation of these persons with special needs into education and the guarantee for the continuation of studies until university level of several blind persons in degree courses of Psychology and Law, among others. In contrast to other states, where realities are very different, Raimundi stressed the attention received by the almost 32,000 members of the ANCI, an organization that has national coverage and gets to the smallest and most isolated parts of the island. HAVANA, Cuba.- (acn) Vietnam’s Prime Minister (PM) Nguyen Tan Dung ratified his country’s willingness to work hard with Cuba in a more practical way for mutual benefit. While meeting with Cuba’s ambassador to that Asian country, Herminio Lopez, Dung expressed his appreciation for the valuable support received from the Caribbean island during Vietnam’s struggle for its national liberation, as well as for his country’s current development, the Prensa Latina news agency reported. He urged the recently accredited diplomatic representative to continue boosting bonds between organizations and ministries of the two countries, in an effective implementation of agreements reached and in the speeding up of new cooperation programs. The PM placed particular emphasis on the economy, trade and investment, as well as on potentials in education, pharmacy, science and technology, to which he added the wish that companies of telecommunications and agriculture also contribute to Cuba. HAVANA, Cuba, Dec 4 (acn) An international investigation commission will hear in London the testimony of Cuban Rene Gonzalez, one of the five anti-terrorist fighters who were given unfair and extremely long sentences in the United States in 2001. At the initiative of the Voice for the Five Campaign, the commission will open sessions March 7 and 8 next year at the prestiged Law Society in London, according to media reports from Washington. Rene Gonzalez, the only one of the Five to have returned to Cuba after having met his prison sentence, will take part at the hearing along relatives of victims of terror actions undertaken against Cuba, lawyers and politicians, according to the International Committee for the Freedom of the Cuban Five. The international campaign for the Cuban heroes was launched October 30 with the participation of renowned personalities in the world of arts, communications, law, politics and representatives of social organizations. Some of the figures with the Voices for the Five Campaign include US political analyst Noam Chomsky, German writer Gunter Grass, former US Attorney General Ramsey Clark, Nobel Peace Laureate Adolfo Perez Esquivel and British actress Emma Thompson, among many others. Gerardo Hernández, Ramón Labañino, Antonio Guerrero, Fernando González and René González were arrested September 12, 1998 in Miami after they infiltrated Florida-based violent organizations that planned terrorist actions against Cuba. In 2001, they were submitted to a biased Miami trial that gave them unfair sentences amidst a hostile atmosphere raised by local journalists and media outlets paid by the US government. HAVANA, Cuba, Dec 4 (acn) Cuba reiterated its willingness to hold a dialog with the United States aimed at finding a solution on reciprocal grounds to the case of US citizen Alan Gross, who is serving a prison sentence for having violated Cuban law. The general director for the United States at the Cuban Foreign Ministry, Josefina Vidal, made it clear that such dialog must include Cuba’s humanitarian concerns related to the four anti-terrorists held in US prisons. Gerardo Hernandez, Ramón Labañino, Antonio Guerrero and Fernando González are currently serving prolonged and unfair prison sentences for crimes they did not commit and that were never proven, the diplomat said in a statement on Tuesday. Their incarceration is having a high human cost for them and their relatives. They have not seen their children grow; they have lost parents and siblings; they are facing health problems and have separated from their relatives and their nation for over 15 years. Vidal referred to a communiqué issued on December 2 by the spokesperson’ office with the US Department of State insisting in the immediate and unconditional release of Gross, by saying that his incarceration has no justification. Alan Gross was arrested, legally processed and punished for having violated Cuban law after he introduced a US-sponsored plan aimed at destabilizing Cuban constitutional order by setting up illegal and covert communications systems based on non-commercial technology, the diplomat explained. Vidal said that such actions constitute serious crimes, which are severely punished in most countries, including the United States, and she added that Gross has received respectful and humane treatment since he was arrested. Cuba understands the humanitarian concerns related to the Gross case, but also considers that the US administration is directly accountable for Gross’ situation and that of his family, and that Washington must jointly work with the Cuban government to find a solution, she noted. The statement also refers to US media reports on a letter sent by 66 US democratic, republican and independent senators to President Barack Obama about the case. The senators called on the President to give humanitarian priority to the Gross case and to take any step in the national interest and in an expedite way to achieve his release, which would have their support. ARTEMISA, Cuba, Dec 3 (acn) Activists from Sweden, the U.K., Finland, Denmark and Russia make up the 57 contingent of the Nordic Brigade in Solidarity with Cuba, which arrived Monday in the western province of Artemisa. The activists come to take a first-hand look at Cuban reality, which is being distorted or silenced in their own countries. The visitors, who will visit several community projects on the island, are scheduled to pay a visit till December 22, said Swedish activist Lars Oberg. They will also meet with relatives of the five Cuban anti-terrorist fighters who were given extremely long sentences in the United States after they infiltrated Florida-based terrorist organizations, said Luis Marron, an official with the Cuban Friendship Institute. The solidarity brigade is also scheduled to visit several sites of interest in the provinces of Pinar del Rio, Villa Clara and Havana and they will also do voluntary work in citrus fruit plantations and in ongoing reconstruction of the Julio Antonio Mella international camp, where they are currently staying. British citizen Jacn Haninaton said he was interested in having a closer look at the cause of the five anti-terrorists, whom he has learned of on the Internet, while Swedish Tara Alden said that since this is her first visit to Cuba, she is interested in learning about Cuban culture and the humane solidairty and hospitality of the Cuban people. She said that she expects to make friends here in Cuba to return each year for new experiences. HAVANA, Cuba, Dec 4 (acn) Cuba celebrated Latin American Medicine Day on Tuesday as the country has the lowest infant mortality rate in its history, according to Health Minister Roberto Morales. In statements to local television, Doctor Morales said that the country registered a 4.2 infant mortality rate, an indicator keeps stable in all Cuban provinces within a range going from 3 to only 5.5 percent, he said. The result proves the sustainable work underway in the Cuban health sector. HAVANA, Cuba, Dec 4 (acn) Doctor Jürgen Kupfer presented in the city of Berlin his book Cuba: Education and School for All, during a meeting attended by friends of the Caribbean island and German professors interested on this topic. The text, the first of its kind in that European nation, is the result of several years of research work carried out by this German pedagogue and answers questions on Cuba’s educational system, the www.cubaminrex.cu Web site reported on Tuesday. Likewise, the book shows, with objectivity, the island’s achievements in the field of education and states the negative effects of the U.S. blockade against Cuba. The author underlined the importance of Jose Marti’s thinking in the conception of Cuban education and stressed the efforts of the revolutionary government to expand education to all places in the country as a basic right of the people. The meeting was organized with the support of the Berlin-Cuba Friendship Association and the society Education for Peace and Policy for Peace, of Berlin’s Education and Science Union. HAVANA, Cuba, Dec 3 (acn) Cuba and Japan reached a bilateral accord to set up a collaboration framework in advanced medical technologies with the participation of Japan's private sector. According to PL news agency, the accord was penned by the Japanese International Cooperation Agency and a Cuban delegation from the ministries of foreign trade and investment, and health. The Cuban delegation met with Japanese government officials from the ministries of Economy, Trade and Industry, and with representatives of teh Japan-Cuba Friendship Parliamentary Legue, as well of the recently created Medical Excellence Japan organization. The mission was headed by Rigoberto Enoa, director of economic policies for Asia and Oceania with the Cuban Foreign Trade Ministry, and it also included eminent doctors with the National Health Committee at the Cuban Parliament. HAVANA, Cuba, Nov 26 (acn) The Cuban Interest Section in Washington announced the interruption of consular services beginning November 26 and till further notice, amidst the impossibility to have a financial institution willing to keep its bank accounts as a consequence of the US economic, commercial and financial blockade of Cuba. A statement by the Cuban Interest Section in the US capital, cited by Cubadebate webpage, explains that despite countless contacts with the US Department of State and numerous banks, the office has been forced to close consular services. The Cuban office explains that on July 12, the M & T Bank notified that it would not continue to offer its services to foreign diplomatic missions. The Bank gave the Cuban Interest Section and the islands permanent mission at the United Nations a limited period of time to finish relations and find a new bank. But due to current restrictions derived from the US blockade against Cuba, the office has not been able to find another bank that keeps the bank accounts of the two diplomatic missions. For this reason, the Cuban Interest Section in Washington has been forced to suspend consular services as of November 26 till further notice, the statement explains and adds that the office will only attend to humanitarian issues and of other nature in a limited way. The Cuban office has reiterated the US Department of State that the US government has the legal obligation to meet international conventions on services to be granted to diplomatic missions and consular offices to facilitate their appropriate work. The statement recalls the accord dated May 30, 1977, which set up the two interest sections both in Washington and Havana, in which both parties affirmed their commitment to international treaties that rule diplomatic and consular relations. 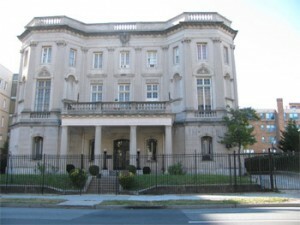 The Cuban office in Washington particularly regrets the inconveniences that this situation will have for Cuban and US citizens, due to the impossibility of the Consular Section to keep offering its services, which include the issuance of passports, visas, legalization of documents and others. The statement concludes by saying that such inconveniences will have a negative impact on family visits, academic, cultural, educational, scientific and sports exchange between Cuba and the United States. HAVANA, Cuba, Nov 28 (acn) The world banking system is having the direct and negative impact of the over-50-year US economic blockade of Cuba, said Cuban American lawyer Jose Pertierra while addressing the closing by the M and T of the account of the Cuban Interests Section in Washington as a result of the US siege of the island. In a release this week the Cuban Interest Section announced its closing of consular services after the bank's measure, which joined other restrictive and hostilie actions against Cuba. Lawyer Pertierra said recalled that Credit Suisse was fined 536 million dollars by the US for crossing the line in the economic blockade against Cuba and some months back the Italian bank Intesa San Paolo was fined three million dollars by the US Government for conducting financial operations in which Cuba was involved. London´s Lloyds Bank is another of the victims of the US Government. For conducting normal bank operations in which Cuba participated, this well-known bank was fined 80 million dollars by Washington. Having Cuba as a client is too risky and financially expensive to the world’s banks as a result of the illegal US persecution of the Caribbean island's financial transactions, Pertierra said and noted that the forced closing of normal consular services by Cuban diplomatic offices in the United States poses a tragedy for the Cuban family. Cubans on both sides of the Florida Straight hope for normality. That means coming and going and gathering as families and friends, just as the Mexicans, Salvadoreans and the Irish do, just to mention a few nationalities, the noted lawyers added. HAVANA, Cuba, Nov 26 (acn) Washington fined Switzerland's Weatherford oil company a total of 252 million dollars for commercial operations with Cuba, Iran and Sudan, according to US authorities cited by international media. An official release by the US Treasury, the punishment against Weatherford is due to some business deals with Cuba between 2005 and 2008 which involved oil equipment. Cited by AFP news agency the release says that the Swiss company also exported technology and services calculated at 23 million dollars, aimed at Iranian oil fields and another group of materials and services was also exported to Sudan between 2005 and 2006 amounting to 296 thousand dollars. The Swiss company was forced to pay 91 million dollars to the Treasury Department in what is considered the strongest fine imposed by that US entity to a non-financial company for violating the blockade of Cuba and sanctions on other countries unilaterally blacklisted by Washington. Weatherford will also have to pay 87.2 million dollars to the Justice Department and 65.6 millions to the Securities and Exchange Commission, which regulates the market of assets. The rest of the money charged, another eight million dollars, will be devided between the Department of Trade and the Attorney General's Office of Texas. Having violated the US blockade of Cuba and sanctions on other countries has implied for Weatherford to submit itself the additional punishment of an audit to check its efforts aimed at abiding by the US policy of sanctions in 2012, 2013 and 2014. The president of Seychelles James Michel stressed the contribution of Cuba to his country's health system, while meeting in the capital Victoria with Cuban foreign minister Bruno Rodriguez, who is on an official visit to that nation. According to PL news agency, a Cuban cooperation brigade made up of 38 doctors and health and sporst technicians is currently offering their services in that country. President James Michel recalled his visit to Havana in 2009, where he took a first-hand look at the island's advancement in the health sector and he reiterated his government's rejection of the US economic blockade of Cuba. Foreign minister Bruno Rodriguez also held talks in Victoria with his counterpart Jean-Paul Adam, and he was received by vice-president Danny Faure and by Parliament president Patrick Hermine. The official visit by minister Rodriguez to Seychelles has favored bilateral exchange on different issues of common interest and other topics on the regional and international agenda, including the negative impact by climate change on the economy of small island nations. HAVANA, Cuba, Nov 28 (acn) Some 58 thousand Venezuelan patients have received medical treatment in Cuba during the past 13 years as a result of the Venezuela-Cuba integral medical treatment agreement. The Coordinator of that binational medical attention programme, Johnny Ramos, underscored the humanist essence of this programme, based on Cuba’s emphasis on high-quality preventive medicine. “Cuba has opened its best medical centers and specialists to Venezuelan patients, who always travel to the Island for treatment accompanied by a relative”, the Venezuelan expert said. Cancer treatment, as well as neurological disorders, orthopeadics , dermatology, cardiovascular diseases and persons with differing addictions are included among the Venezuelan patients sent to Island for specialized treatment, the Venezuelan official said. HAVANA, Cuba, Nov 27 (acn) In a further effort to diversify tourist offers for foreign visitors, who pick the island as their holidays destination, the Cuban government authorized the stay in Cuban territory of tourist yachts up to five years, with the possibility to renew their licenses for more time. The initiative was established by a government decree that rules the organization and operations of harbor and maritime services at the island's marinas. The measure, which is also backed with resolutions issued by the ministries of Tourism, and Finance and Prices, is mandatory for providers and those who benefit with the new services in an effort to improve current arrangement related to the entrance and stay of boats. And in order to increase competitiveness at Cuban marinas, the decree establishes a definition of these facilities, with information on their planning activity, development and preservation in Cuban territory. Some of the rules include that if the owner of a yacht leaves the island for a prolonged period of time, he must sign a contract with the Marina facilities to guarantee the custody and services of his boat. The legal measure allows those interested in bringing their boats to Cuba to previously send the Tourism Ministry information on their ship, crew and passengers, which will facilitate access to Cuban territorial waters, according to a Xinhua report. Environment-related regulations stipulate that during docking or anchoring no ship can undergo repairs, maintenance, cleaning or painting activities, while dumping wastes or polluting substances or articles on the water is strictly prohibited. The government decree also establishes the performance and functions by a National Commission for Nautical Activities, which is in charge of implementing the policies relevant to the marinas in tune with the interests of authorities in the field. In mid 2013, the Cuban Parliament passed the Law on Maritime, River and Lake Navigation, which regulates the general performance of this sector in Cuban territorial waters as well as all aspects related to merchant, fishing and recreational maritime activities. Victoria, Nov 28 (Prensa Latina) President James Michel stressed the value of Cuban contributions to Seychelles' healthcare system, after receiving the Caribbean island''s Foreign Minister Bruno Rodriguez yesterday, on an official visit here. Cuba has a collaborative brigade in this country comprised of 38 physicians, and health and sports technicians. Michel recalled that during his visit to Havana in 2009, he could verify the Cuban progress in these spheres, and reiterated his government's opposition to the U.S. blockade against Cuba, the Cuban ambassador to Victoria, Orlando Alvarez, told Prensa Latina. Rodriguez also held official talks with his Seychelles peer, Jean-Paul Adam, and was received by Vice President Danny Faure and the Speaker of Parliament, Patrick Hermine. The visit of the chief Cuban diplomat has resulted in a rich exchange on many issues of bilateral interest as well as the regional and international agenda. The negative effects of climate change on small island economies were also discussed, Alvarez said. CIENFUEGOS, Cuba, Nov 26 (acn).-- The oil refinery jointly operated by Venezuela and Cuba in the Southern Cuban Port City of Cienfuegos has already met its production quota for this year, with almost 19 million 700 thousand barrels of crude oil. The refinery is the most important economic project installed in Cuba by the Bolivarian Alliance for the Peoples of Our America regional integration bloc. Since its inauguration six years ago, it has produced 121.3 million barrels of oil. The facility is the main economic project managed by ALBA in Cuba and was officially inaugurated on 21 December, 2007, during the Fourth Petrocaribe Summit, held in Cienfuegos in the presence of Bolivarian leader Hugo Chavez and Cuban President Raul Castro. This important binational industry has also excelled in the savings of inputs, such as water, chemical substances, lubricants and fuel oil. Plant efficiency has also increased and this year the operations team was able to improve the reduction of inputs and increase plant output, said engineer Humberto Padron, the refinery’s manager. The efficient operation of the refinery also contributes to the preservation of the environment in the huge bay of Cienfuegos, one of the largest on the Southern Cuban coast. Padron also said that the installation of new equipment last year has contributed to further improving the quality of gasoline, diesel and other fuels and oils produced at the Cienfuegos refinery. Havana, Nov 26 (Prensa Latina) Guinean Culture Minister Ahmed Tidjane Cissé today visited the Organization of Solidarity with the People of Africa, Asia, and Latin America in the Cuban capital, in what became a solidarity meeting. Cissé, who is on an official visit to Cuba on the invitation of Cuba Culture Mininster Rafael Bernal, was received by OSPAAAL General Secretary Lourdes Cervantes, representatives of Puerto Rico and Syria, and members of the OSPAAL executive secretariat. In welcoming remarks, Cervantes emphasized the historic role played by Guinea in the African liberation struggle against colonialism, and the founding of OSPAAAL and its executive secretariat. Guinea is still a member of the secretariat. Cervantes stressed the legacy of Guinea independence hero Amhed Sekou Toure (1922-1984), whom she described as one of the greatest leaders in African history and the Third World, and said his example was still present in the struggle the OSPAAAL continues to carries out for tri-continental solidarity. Havana, Nov 28 (Prensa Latina) Nearly 100 Latin American patients have received services at Cuba''s National Rehabilitation Center for the Blind and Visually Impaired, it was reported during the 7th Congress of the National Association for the Blind and Visually Impaired, which ends Thursday in the Cuban capital. HAVANA, Cuba, Nov 26 (acn) Mexico's Metropolitan Autonomous University and the University of Havana signed a series of cooperation accords during a ceremony attended by Mexican ambassador to Cuba Juan Jose Bremer. The rector of the University of Havana Gustavo Cobreiro and of the Mexican higher education center Salvador Vega penned the documents on Monday, which stipulates the exchange of students both in regular and postgraduate courses, and that the subjects they approve should be accepted by the two universities. A news release by the Mexican embassy in Havana explained that the accords reflect the willingness of cooperation shared by the two parties, the two governments and the two nations, according to notimex news agency. The universities of Havana and Mexico committed themselves to exchange up to four students for a top period of one school year or three quarters and during one semester or two quarters at minimum. The protocol stipulates that the subjects passed by the students during such periods of time will be recognized by the university of origin. HAVANA, Cuba, Nov 25 (acn).— A Cuban 32-inch screen digitally integrated TV set will be shown this coming Wednesday at the Twelfth Edition of the Technological Week event. The new model of TV set is produced by the Electronic Industry Ehterprise, a possibility opened by a close relationship with its Chinese developers . The set is undergoing tests for its final registration in the industrial output record. The price of this set is very competitive and its high quality guarantees its successful entry in the market of electric appliances. The new equipment introduces several innovations, such as the reproduction of music, films, videos and photos, besides its normal reception of TV signals. The Technological week event is focusing on the application of electronics to educational processes and to the sustainability of telecommunications in Cuba. HAVANA, Cuba, Nov 25 (acn)--The President of the Cuban Councils of State and Ministers, Army General Raul Castro received the President of the Russian Rosneft Oil Company, Igor Ivanovich Sechin, who paid a working visit to Cuba. According to Granma newspaper, Raul Castro and Igor Ivanovich expressed their willingness to keep deepening relations in the sectors of hydrocarbons, health care, tourism, energy, the training of technicians and specialists in the oil field, in which there are important opportunities for bilateral collaboration. Raul and Sechin also addressed the current update of the Cuban economic model, the regional integration process and the opportunities offered by the Mariel Special Development Zone for future investment. The meeting, which took place on Saturday, was also attended by Russia's ambassador to Havana Mikhail L. Kamynin and by the president of the Board of Directors of the Inter Rao company, Boris Kavolchuk. On the Cuban side was government vice-president Ricardo Cabrisas along Energy and Mining Minister Alfredo Lopez Valdes, and the interim minister of Foreign Trade and Investment Antonio Carricarte. Argentine Movement Warns of Situation of Cubans imprisoned in U.S.
Rosario, Argentina, Nov 24 (Prensa Latina) Argentine Movement of Solidarity with Cuba, MASCUBA today alerted the world on the seriousness of the legal situation of four Cuban antiterrorist fighters serving unjust and arbitrary sentences in prisons in the United States. In the Resolution "For the Freedom of the 5", adopted unanimously at the 13 Meeting of Solidarity with Cuba which concludes on Sunday, it was noticed that Rene Gonzalez could return to the island after serving his sentence and certain demands, but "the other four remain in prison." The resolution refers to Gerardo Hernandez, Antonio Guerrero, Ramón Labañino and Fernando Gonzalez, imprisoned (like René) since 1998, after being condemned by a court in Miami in a manipulated process, as evidence found corroborate, and sentenced to severe penalties. The Five, as they are known in the international campaign for their release, monitored criminal actions conceived against their country by anti- Cuban groups living on U.S. soil. According to the text signed today, there is no political will in Washington to resolve this issue despite the global claim, including a growing portion of the U.S public opinion to which the main media try to keep on the sidelines of this case. The panel that adopted the resolution was presided over by the Argentine intellectuals Lidia Donnini, Alberto More and Leticia Faccedini, and Cuban Deputy Kenia Serrano. The legislator, president of the Cuban Institute of Friendship with the Peoples, headed the delegation of the island to the solidarity meeting in Rosario, attended by over 500 members from about 25 groups across Argentina and had the support of national parliamentarians, provincial and municipal councilors, among other figures. MASCUBA and the Argentine Committee for the Freedom of the Five announced that they will redouble efforts in the fight for the Cuban antiterrorist fighters, as to promote the demand for their freedom in the Universal Day for Human Rights Declaration on December 10. They will also support the Third Event of Solidarity "Five days of action by the Five" in Washington, from June 4 to 11, 2014, with actions outside the U.S. Embassy in Argentina. They indicated that they will increase the spread of information about the just cause of the release of the Five, in particular during the 2014 World Cup, in coordination already agreed with Brazilian organizations of solidarity with Cuba. Rosario, Argentina, Nov 24 (Prensa Latina) The final declaration of the XIII Meeting of Solidarity with Cuba, which concluded here today, confirms the willingness of the Argentine movement of friendship to branch further and increase support to the island. "!Cuba is not alone! !the Island of Dignity and its projects for a socialism even better are still bathed in a sea of solidarity and admiration! !If Cuba is touched the world stands!" states the declaration unanimously acclaimed. More than 500 members of 25 groups converged around this weekend in Rosario, the birthplace of iconic Cuban-Argentine guerrilla fighter Ernesto Che Guevara for reviewing solidarity activities, provide new actions, and discuss the current challenges in Latin America and also in the Caribbean country. The event, organized by the Multisector Rosario Argentine Movement of Solidarity with Cuba, MASCUBA, with support from the City Council (local legislature) was also attended by national and provincial congress, district councilors and leaders of unions and political, social and youth organizations. The declaration stresses the urgent need of the end of the economic, commercial and financial blockade imposed by the United States against Cuba, which was described as genocidal policy, and demands the immediate release of the Cuban antiterrorists fighters who are still imprisoned in that country. Known as the Cuban Five, Gerardo Hernández, Antonio Guerrero, Ramón Labañino and Fernando Gonzalez remain behind bars, while René González, who spoke by telephone with participants in the event, was released this year. In that sense, the declaration calls to provide the greatest possible support to the Third World Meeting of Solidarity with Cuba to be held in Havana from October 27 to 31, 2014, while warning of the dangers that threaten the integration process and Latin American unity. At the same time, it warns that the "reactionary right in Argentina wants to settle a government in 2015 to wipe out the achievements in human rights, social progress and friendship with Cuba of these ten years." It also requires the return to Cuba of the territory where Washington keeps the illegal Guantánamo Naval Base and demands the independence of Puerto Rico, the closure of the American military facilities in Colombia and the return of Falkland Islands to Argentina. The statement expresses the wish of MASCUBA of "a just solution to the armed conflict in Colombia, in which Cuba is a facilitator of the peace talks", while supporting the claim of Ecuador for Chevron to pay their colossal environmental debt of Lago Agrio. Finally, Rosario meeting expressed concern about "the risks to world peace by triple tourniquet of the empire: the continuing economic crisis, its treacherous undemocratic spy and the plans of aggression against Syria and other countries defending their sovereignty." HAVANA, Cuba, Nov 19 (acn) Army General Raul Castro, president of the Cuban Councils of State and Ministers announced Tuesday morning the beginning throughout the island of the strategic military exercise Bastion 2013, which takes place throughout the island. This important preparation of command posts under the leadership of Cuban Communist Party and with the participation of the government, the State's Central Administration Bodies, enterprises, armed institutions and the people will wind up with National Defense Days on November 23rd and 24th. The exercise, which runs till November 22nd, includes tactical drills by Cuban regular troops made up of young men and women, who honor their compromise with the defense of their homeland. In 1980, Cuba carried out the first Bastion exercise; since then, the country has enriched and improved its military doctrine based on the War of a All the People, which guarantees each citizen the resources and place, a way to fight under the leadership of the Communist Party, an article on Granma newspaper reads. Havana, Nov 20 (Prensa Latina) Cuba continues today the strategic exercise Bastion 2013, to raise the level of training and cohesion of all directive boards and military commands to face enemy military aggressions. Bastion 2013 began yesterday after Cuban President Raul Castro opened at 9:00 am local time the military drills, to be run until Friday, Nov. 22. According to the also army general and president of the National Defense Council, the exercise will run rationally, and includes the participation of the people in the National Defense Days on November 23 and 24. The president's words opened the activities in all provinces, in which the operational dynamics simulate possible scenarios for military interventions. The exercise includes entities from the Communist Party of Cuba, the government, the bodies of the central administration of the State, companies, units and soldiers of the Revolutionary Armed Forces and the Ministry of Interior. All these entities act under the Cuban defensive concept of War of the Entire People, involving the whole society, and ensuring that every citizen will have a weapon, a place, and a way to defend the homeland. HAVANA, Cuba, Nov 19 (acn) --Peace activists from all over the world have again demanded the restitution to Cuba of the Guantanamo Naval Base, a portion of Cuban territory illegally occupied by the United States for over a century. The claims were issued by delegates from many countries on Monday at the inauguration in the city of Guantanamo of the Third Seminar for Peace and the Elimination of Foreign Military Bases, underway until this Wednesday. The Seminar was opened by Silvio Platero, President of the Cuban Movement for Peace and Sovereignty of the Peoples and is being attended by Brazilian pacifist, Maria do Socorro Gomez, Chairwoman of the World Peace Council, and former US Attorney General Ramsey Clark. Delegates from many countries have blasted the illegality of the US Base, which is even used as a center of torture of prisoners from all over the world, who were accused of alleged terrorist activities. The Third Seminar for Peace and the Elimination of Foreign Military Bases will close tomorrow, Wednesday, with a rally in the city of Caimanera, bordering the US base and torture center by the US military. The base was occupied by the United States last century by virtue of so-called legal instruments imposed on the then young Cuban nation. Guantanamo, Cuba, Nov 18 (Prensa Latina) The Network of Intellectuals in Defense of Humankind demanded here today that the United States return to Cuba the territory occupied by the Guantanamo naval base, which was seized a century ago and now houses an illegal detention center. In a message on the occasion of an international seminar against foreign military bases, the network, which was created in 2003, demanded the closure of that prison, where detainees are tortured and humiliated in violation of international law. The meeting, sponsored by the World Council for Peace, has brought together 100 researchers and activists to denounce interference, imposition and disregard for others' rights. Havana, Nov 19 (Prensa Latina) Five Cubans who were locked up in U.S. prisons in 1998 have been victims of the repression and infamy of an imperialist system that refuses to change, Mexican attorney Eduardo Lopez said today. At Havana's international conference center, Lopez, who teaches at the National Autonomous University of Mexico, said that the men, known as the Cuban Five, had suffered unprecedented cruelty. In his opinion, the Five were subjected to that treatment for defending democracy and the law. Antonio Guerrero, Ramon Labañino, Fernando Gonzalez, Gerardo Hernandez and Rene Gonzalez were arrested in Miami in 1998 for monitoring groups that were organizing and financing terrorist actions against Cuba. Rene Gonzalez in now in Cuba after completing his sentence and giving up his U.S. citizenship, but the other four remain in prison, serving long sentences. Lopez, whose remarks were part of a master's lecture at the Law 2013 International Conference in the Cuban capital, urged participants to participate in actions in solidarity with the fight to free the Five. Sponsored by the National Organization of Law Offices, the conference, which ends Thursday, features presentations and lectures in seven working commissions, as well as master's lectures in plenary sessions. Participants include well-known figures such as the attorney general of the Republic of Angola, Joao Maria Moreira, and the president of the Bolivian Supreme Court's Criminal Division, Fidel Marcos Tordoya. HAVANA, Cuba, Nov 18 (acn) The Cuban scientific community is determined to contribute to the country's strategy aimed at updating the Cuban economic model. During a meeting of the Cuban Academy of Science participants spoke their minds about how the science, technology potential can back the implementation of the economic and social guidelines adopted by the Cuban Communist Party to improve the socialist economy. Academy president Ismael Clark described as crucial the role of scientsts in the economic development of the country. Fidel Castro Diaz-Balart, scientific advisor to the Council of State called on the Academy to participate in the design of of specific national programs and he put the climate change strategy to reduce vulnerabilities as an example. Other experts stressed the need to strengthen relations with university commissions in charge of designing different higher education courses in order to include in those curricula the most recent advancement in the field of science and technology, particularly those that help improve the economy. Havana, Nov 19 (Prensa Latina) More than 400 delegates from Cuba and other countries in Latin America, North America, Europe and Africa are from today attending the International Congress Advocacy 2013, focusing on the management and resolution of disputes. During the opening at the Havana Convention Center, President of the National Organization of Collective Law Offices (ONBC), Ariel Mantecon, said the event is a colophon, a moment of summary and conclusion of previous days, and preparation for the coming edition of the congress. He explained that the vast majority of foreign participants made a economic effort to be present at the meeting, which interpreted as "a profound gesture of friendship towards lawyers and the Cuban people in general." When talking about delegates ONBC members, Mantecon, also chairman of the Organizing Committee of the meeting said Advocacy 2013 is also the epilogue of a creative process that had its beginnings in provincial legal conferences. He also referred to the massive presence of lawyers not members of the organization, working at legal sector entities, corporations or institutions, and highlighted the "large number of submissions received that met the quality requirements." The Program of Advocacy 2013, which ends next Thursday, will include lectures and conferences in seven working committees and lectures. The conference is attended by personalities such as the Attorney General of the Republic of Angola, Maria Joao Moreira, and President of the Criminal Chamber of the Supreme Court of Bolivia, Fidel Marcos Tordoya. The ONBC is the institution that groups in Cuba to those lawyers, whose main role is to represent and defend people and legal entities before courts, administrative bodies or other institutions. Guatemala City, November 18 (RHC).-- Members of Cuban Medical Teams working in Guatemala since 1998 have saved the lives of at least 286 thousand 141 Guatemalan patients until October 2013, according to official figures released in that Central American nation. Statistics show that the successive Cuban Medical Brigades in Guatemala have attended in this period 35 million 431 thousand 805 patients, according to pl news agency. Surgical operations were performed by Cuban doctors on 273 thousand 606 patients, including general surgery, gynecology, obstetrics and orthopedics. Meanwhile the free-eye surgery program known as Operation Milagro led to surgical interventions in 122 thousand 658 patients, all of whom recovered their vision. The latter began in 2004 as a humanitarian project cosponsored by Venezuela and Cuba to help deprived Latin American residents to regain vision impaired by disease, trauma or other reasons. Berlin, Nov 19 (Prensa Latina) The Kulturhaus-Havana Partnership (the Havana Culture House) has been founded in this German capital, attended by the group's founders, comprised of five Cubans, an Italian, and a German. The Partnership is aimed at promoting two-way cultural exchange, and expects to bring Cuban and German artists together. Among the activities the group will organize is the creation of joint cultural activities, to ensure the participation of Cuban and German artists, the island's embassy here reported. It will be also devoted to the promotion of cultural events in Berlin and Havana. Andreas Wendland, president of the partnership, said the project is an idea he has held since 1973, when the World Festival of Youth and Students was held in Berlin. HAVANA, Cuba, Nov 5 (acn) In order to promote foreign investment in Cuba, CANEC SA Economic Consulting provides services to more than 60 foreign companies, to which they facilitate entering the Cuban market. Jesus Pulido Catasús, business executive director of the entity belonging to the National Association of Economists and Accountants of Cuba (ANEC by its Spanish acronym), told ACN that their main customers come from countries like Spain, Canada, France, Germany, Panama, Turkey and China. Regarding the presence of CANEC in the 31st Havana International Trade Fair, FIHAV 2013, underway in Expocuba, the manager noted that its goal is to identify new customers among the more than 1,400 companies from 65 countries present, in order to provide them information on the potential of Cuban economy. He stressed that counseling helps them to develop efficient business in Cuba, while encourages a direct relationship between provider and domestic suppliers. Pulido also reported that CANEC services include the preparation of documentation for the future establishment of branches of foreign entities in the country. Such agreements allow demonstrating the prestige of Cuban entrepreneurs in fulfilling contracts, as to date there has been no disagreement regarding payments, Pulido Catasús stated. In addition to advising foreign companies not based in Cuba, more than 1,300 CANEC SA consultants and auditors offer solutions on economic, accounting and financial issues to national entities, joint ventures and subsidiaries of foreign firms. HAVANA, Cuba, Nov 5 (acn) The signature of an economic complementation agreement between Cuba and Venezuela and official openings of pavilions of important trade partners of Cuba happened today in the second day of the 31st International Fair of Havana (FIHAV 2013). During the celebration of Venezuela’s National Day, the document was signed by Rodrigo Malmierca, Cuban Minister of Foreign Trade and Foreign Investment, and Alexander Fleming, Trading Minister of the South American nation. The agreement will contribute to the gradual elimination of tariffs, a move that will increase the exchange of products and services. On the other hand, it excelled the interest of China and Cuba to strengthen commercial ties, which reached 400 000 million dollars in the first eight months of 2013. Chen Bing, head of business of the Asian nation, said that figure represents an increase of 20 percent compared to the same period of 2012. During last Monday it was also celebrated Spain’s National Day, third economic partner of Cuba, and it was known that the exchange between the two countries exceeds one billion dollars so far this year. With more than 130 exhibiting companies, the European nation repeats as one of the largest representation in the main Cuban market. The presentation of the rums Cubay Elixir 33 and Cubay Carte Blanche Extra Old showed the opportunity for diversification of production for Cuban domestic market, tourism and exports. HAVANA, Cuba, Nov 5 (acn) the third day of the XXXI International Trade Fair of Havana opened today with a conference on business opportunities for Cuban and foreign entities in the Mariel Special Zone Development (ZEDM by its Spanish acronym). Rodrigo Malmierca, Minister of Foreign Trade and Investment (MINCEX), and Ana Teresa Igarza, CEO of the Regulatory Office of the ZEDM, will be in charge of providing details on the issue. Recently Malmeirca said that the opening of the ZED in Mariel, located in the western province of Artemisa, will be in January 2014 and there will be implemented special policies to promote environmentally sustainable economic development through foreign investment that provides technological and managerial innovation. Moreover, representatives of the Cuban Vessel Register Classification Society also make a presentation in FIHAV, one of the largest trade fairs in Latin America, attended by one thousand 400 exhibitors from 65 countries. Canada, Brazil, France, Russia and the UK, major trading partners of the Island, will celebrate their national day on Tuesday, and also there will be a business meeting between Cuba and Brazil. FIHAV will run until next Saturday and is done in the context of the 50th anniversary of the Chamber of Commerce of Cuba. HAVANA, Cuba, Nov 4 (acn) The Cuban biotechnology’s impact on cancer control and innovative therapeutic product developed by the Molecular Immunology Center ( CIM ) , will be presented at the XXXI International Fair of Havana ( FIHAV ) 2013 ), which began this Sunday in this capital. In a round of negotiations, scheduled for November 7 in the fairgrounds of EXPOCUBA, Cuba will present a multimedia made for VAXIRA, last therapeutic vaccine for the treatment of lung cancer, with promising results, CIM scientists announced. The institution conducts more than 60 clinical trials in Cuba for several diseases, most notably cancer, which is the leading cause of death in the country since 2012. In an exclusive interview with ACN, Dr. Mayra Ramos, head of the department of Clinical Trials CIM - within the BioCubaFarma business group, announced that they are developing new therapeutic vaccines and monoclonal antibodies. In the latter type the Caribbean nation has registered nimotuzumab for patients with tumors of the head and neck, brain, both in adults and in children. She also said that this product has been applied in colorectal oncogenic diseases, hepatocellular, lung cancer, brain metastases of malignant tumor in those and other locations. CIM studies, in conjunction with the Coordinating Center for Clinical Trials, also have demonstrated efficacy with therapeutic vaccines recorded in Cuba for the treatment of lung cancer: the CIMAVAX-EGF and Racotumomab (Vaxira). We have also performed other clinical trials with these immunogens in prostate, breast and colon cancers, the specialist said. HAVANA, Cuba, Nov 3 (acn) The Expocuba photovoltaic park, located in the namesake fair grounds that currently hosts the Havana Trade Fair, was officially inaugurated this Sunday, and for the last two days has been synchronized with the national power grid. Built in less than three months for the workers of the Works of Architecture No. 37, of the province of Cienfuegos, the park will generate 1,500 megawatt / hour when it is at full capacity. The unit will also save the country some 530 tons of fuel annually, reducing carbon dioxide emissions to the atmosphere and cover 50 percent of the electricity demand of the center, one of the 35 with highest power consumption in Havana. Alfredo Lopez, Minister of Energy and Mines, said that the construction of the Chinese technology station can be a role model on the island. He reported that in the near future they expect to set up another photovoltaic park in Expocuba to meet its energy needs. The event was part of the opening program of the 31st International Trade Fair of Havana, which is attended by over three thousand visitors from 65 nations. Gustavo Rodriguez Rollero, Minister of Agriculture, and Chen Ping, chargé d'affaires of the Chinese Embassy in the island, were present, along with guests and builders. HAVANA, Cuba, Nov 4 (acn) Heberprot-P, unique of its kind in the world to avoid amputation in diabetic foot ulcers, is registered in 19 countries, a Cuban expert announced in Havana. In statements to ACN, Dr. Manuel Raíces, researcher at the Center for Genetic Engineering and Biotechnology (CIGB by its Spanish acronym), said that with such therapy they have treated more than 132,000 patients worldwide with successful results. From that total, more than 24,000 are Cubans and the relative risk of amputation has been reduced by 71 percent, generating a high quality of life for the population, the CIGB researcher stated, whose entity is actually participating in the 31st edition of Havana International Fair, FIHAV 2013. The expert added that over 60 percent of patients who have underwent therapies using this innovative product in the Caribbean nation are treated in the system of Primary Health Care (PHC), which shows the perception of risk within diabetic population. Dr. Raices noted that before 2016 it is expected that more than 90 percent of Cuban population to attend the PHC, which will considerably reduce the risk of amputation. He stressed that Cuba performs actions with Ecuador aiming to extend these programs to China and the European Union, where they are laying the groundwork to develop in 2014 a phase two clinical trial in complex ulcers. Raíces announced that Russia completed a phase three clinical trial, which was qualified as successful and the product must be registered soon. In his lecture, as part of the 6th Session of Cuba-Russia Business Committee in FIHAV 2013, the scientist spoke about work prospects in the Eurasian nation, which with 142 million inhabitants has a prevalence of nine percent of diabetes, and about 12 million people suffer from this disease. HAVANA, Cuba, Nov 4 (acn) “The Cuban economy is still in the process of transformation and maintains its vitality and growth by about three percent”, Cuban Minister of Foreign Trade and Investment (Mincex) Rodrigo Malmierca, said in Havana. At the opening the 31st International Trade Fair of Havana, FIHAV 2013, Malmierca remarked that the country is moving in the process of updating its economic model aimed at the development of productive forces and efficient management . In the presence of the vice presidents of the Council of Ministers, Ricardo Cabrisas and Major General Antonio Enrique Lussón , member of CPC Central Committee , and other state leaders and the government , the head of MINCEX welcomed the broad participation of key business partners of the island, including Venezuela , China , Russia and Spain . The Cuban economic model reaffirms socialism and planning as cornerstones for development, while recognizing and promoting the development of new non-state forms of property management such as cooperatives and self-employed, the official said. He added that the work that is undertaken today to update the foreign investment policy is done under the conviction of the important role of foreign capital in the country's development. Malmierca gave details about the Mariel Special Development Zone, located in the province of Artemisa, whose opening will be in January 2014 where they will establish special policies to promote environmentally sustainable economic development through foreign investment that contribute with and technological and management innovation. HAVANA, Cuba, Nov 4 (acn) The third brigade of Cuban doctors will leave in the next hours to Brazil, to provide services in the most remote areas of the geography of South American giant. The new group, which is part of the More Doctors for Brazil, had a farewell ceremony this Sunday in the capital, with the presence of a member of the Party Central Committee, Dr. Roberto Morales Ojeda, Minister of Public Health (Minsap), who handed the flag to the brigade. Marcia Cobas , deputy minister of Minsap, spoke of the training received by doctors in Portuguese, Brazil’s official language, and the health care system of the sister nation. She said that Brazil has over 190 million inhabitants, which makes it the fifth most populous country in the world. She said the government aims to achieve the goal of having 2.7 doctors per thousand inhabitants which now is 1.8 and for that it needs more than 169,000 other doctors. Cobas said that the members of this third contingent are mostly young; adding that more than 70 percent of them accumulated over 15 years of experience, with a high sense of ethics, humanism and responsibility. They represent the 15 provinces and the special municipality of Isle of Youth, and will have the task of consolidating the international recognition enjoyed by the Cuban health system. Dr. Roilder Frómeta, specialist in General Medicine and Master in Emergency Medicine-who received the flag from the hands of health minister, acknowledged the commitment involved leading a group of highly experienced professional colleagues, who will work in mountainous, indigenous and jungle areas where people needs them. The advance party of Cuban doctors arrived in Brazil on August 24, and on October 7 the second group arrived, whose dedication and careful attention is already recognized and acknowledged by the Brazilian government and people. HAVANA, Cuba, Nov 4 (acn) Ricardo Cabrisas, vice president of the Council of Ministers, said today that there is potential to increase cooperation agreements with Venezuela. While walking the grounds of the Venezuelan nation pavilion at the XXXI International Fair of Havana (FIHAV-2013), Cabrisas said that strategies are focused on promoting high quality products. He said that many of the items and services that are exhibited in the sample can be marketed in other countries of Latin America and the Caribbean. During a meeting in the Fair, experts from both countries identified as priority areas education, health, sports, culture, food, construction, transport, communications and information, energy and strengthening social missions. During the XIII Meeting of the Cuba-Venezuela Joint Commission, held last April in the capital and led by Army General Raul Castro, First Secretary of the Central Committee of the Communist Party of Cuba and president of the Councils of State and Ministers, and the Venezuelan president, Nicolas Maduro, 51 projects were approved. HAVANA, Cuba, Nov 5 (acn) As part of activities for World Diabetes Day, which is celebrated on November 14, the provinces of Artemisa and Mayabeque will develop the First Regional Scientific Conference on the disease. The Provincial Health Direction and political and mass organizations of Bauta town sponsor the conference to be held from November 11 to 14, Mailyn Palmero, promoter of Heberprot-P, novel and unique Cuban medicine for diabetic foot ulcers, which is patented in 19 countries, told ACN. The scientific sessions, dedicated this year to the management of patients with diabetic foot and treatment with this product developed by Cuban biotechnology, will contribute to improve the quality of care and the administration of the drug to people with this affection in the western territory, she said. These include active investigations led to the diagnosis of the disease and its complications, educational lectures by health professionals and meetings with the lead researcher of Heberprot-P, PhD. Jorge Berlanga from the Center for Genetic Engineering and Biotechnology. It will also be developed posters and brochures campaigns, informational meetings aimed at diabetic foot ulcers and its novel treatment as alternative to avoid amputation. The World Diabetes Day is celebrated on November 14, most important awareness campaign of the planet, established by the International Diabetes Federation and the World Health Organization (WHO) in 1991, in response to the alarming increase of such cases in the world. Today there are more than 366 million people affected with this condition that kills 4.6 million people annually, which represents a challenge for health systems worldwide, according to WHO statistics. Havana, Oct 30 (Prensa Latina) The First Vice President of Cuba, Miguel Diaz-Canel, met today with the Vice President of India, Mohammad Hamid, who is in an official visit to Cuba. Both leaders reviewed the state of the bilateral relations and exchanged discussed on the strengthening of economic, trade and cooperation links between the two countries. They also exchanged ideas about topics of interest on the international agenda, the convergence of the positions of the two countries in international organizations, as well as the role displayed by Cuba in the exercise of the pro tempore presidency of the Community of Latin American and Caribbean States. Hamid, who also chairs the Rajya Sabha (upper House of the Parliament), began yesterday his official visit to Havana, where he participated in the inauguration of the Cultural Festival of India. He is accompanied by the Minister of State for Human Resource Development, Shri Jitin Prasada, parliamentarians and other officials of the Government of the Republic of India. Bogota, Oct 30 (Prensa Latina) The northern city of Medellin will host as of today the 22nd National Meeting of Solidarity with Cuba, where Colombians from many departments will strengthen the bonds of brotherhood and cooperation with the island. Outstanding personalities such as Aleida Guevara, daughter of Argentinean-Cuban guerrilla fighter Ernesto Che Guevara will attend until Saturday, Nov. 2, the event, a space to contribute to the visibility of the Cuban Revolution. A predominant theme of this meeting is the current situation of the Cuban antiterrorist fighters Antonio Guerrero, Gerardo Hernandez, Ramon Labañino, and Fernando Gonzalez, unjustly condemned in the United States. They, along with Rene Gonzalez, who recently returned to Cuba after completing the sentence a Miami court imposed him and renouncing his U.S. citizenship, were arrested in September 1998, for monitoring the activities against the island by terrorist groups based in that northern territory. Work sessions will begin today with the lecture "Economy model and solidarity thought in Cuba," by the director of the Institute of Philosophy of the Ministry of Science, Technology, and Environment of the island, Concepcion Nieves. Today's agenda includes the forum "Agroecology and food security systems in Cuba," a model for exploring, with panelists such as Leonardo Iglesias, representative of the Cuban Association of Small Farmers, and Edinson Muñoz, legislator to the Assembly by the Department of Antioquia. For 7th occasion, young Colombians will hold parallel a national meeting, to reaffirm their support to the Revolution led by Fidel Castro. HAVANA, Cuba, Oct 30 (acn) Members of Ukraine's Leninist and Communist Young League or Konsomol are visiting Cuba to learn more about the island's socialist project. The visitors met on Wednesday with Cuban young communists at the building hosting the Cuban Friendship Institute, where they were briefed on the work of communist cells at work centers and schools. The Cuban youths explained about their usual activities, such as their meetings and the setting up of working teams that promote participation by the youths on different activities. The Ukrainian visitors referred to the working agenda of their organization, which turned 95 years old last Tuesday and that bears the image of Che Guevara as their logo. They said Cuba is a source of inspiration for them, and that they usually organize campaigns for the release of the Cuban anti-terrorist fighters held in US prisons, as well as other activities related to Cuban culture. Kingston, Oct 29 (Prensa Latina) Cuban residents in Jamaica condemned in this capital the imprisonment to which four antiterrorist fighters from their country are subjected to in the United States for more than 15 years, which they considered unfair. Gathered at the Havana embassy in Kingston, participants called for the release of Gerardo Hernandez, Fernando Gonzalez, Ramon Labañino, and Antonio Guerrero, who are serving harsh sentences, for alerting their country from violent actions planned by terrorist groups established in U.S. territory. They, along with Rene Gonzalez, who returned to Cuba after completing his sentence, a period of supervised release, and renouncing his U.S. citizenship, are internationally known as the Cuban Five. Following the allegation, participants at the meeting adopted a declaration to reflect support for the antiterrorist fighters. The meeting included an exchange with Cuban ambassador to Jamaica, Bernardo Guanche, and third secretary of the Mission, Junior Rodriguez. HAVANA, Cuba, Oct 29 (acn) The Cuban Resolution on the need to lift the over-50-year US commercial, economic and financial blockade of the island was overwhelmingly approved by the UN General Assembly with 188 votes in favor. The United States and Israel remained isolated as they continue to support the US's hotile Cuban policy, which has inflicted damage on the island estimated at over one trillion 157 billion dollars, according to recent information, plus a huge impact on the people. Palau, which in 2012 had voted against the Cuban resolution abstained this year, along the Marshal Islands and Micronesia. Since the resolution was first submitted to the UN vote in 1992, Cuba has received strong support from the international community. Over 180 UN states have backed the document over the past nine years. The illegal siege posed by Washington in 1962 was further reinforced with extraterritorial laws and it constitute a flagrant violation of the Cuban people's human rights, and of those of citizens of third countries and even of the people of the United States. HAVANA, Cuba, Oct 29 (RHC)Cuban foreign minister Bruno Rodriguez said at the UN General Assembly on Tuesday that the damage inflicted by the US economic, commercial and financial blockade of Cuba are incalculable. The criminal policy causes suffering and constitute a massive, flagrant and systematic violation of human rights; 76 percent of Cubans have lived under the devastating effects of the blockade since they are born, said the foreign minister as he addressed the 68 plenary session of the United Nations General Assembly. Rodriguez recalled that the damage inflicted by the over-50-year blockade on Cuba are estimated at over one trillion 157 billion dollars. The blockade qualifies as an act of genocide, according to article 2 of the 1948 Geneva Convention on the Prevention and the Sanction of Genocide, and as an act of economic war, according to to the Declaration on the Right of Maritime War adopted in 1909, he said. The top diplomat stressed that the blockade was designed to submit the Cuban people to hunger and economic shortage to cause the fall of the Cuban government, as it was established in a US government memorandum dated April 6, 1960. Minister Rodriguez said that under the Obama administration, the blockade was reinforced with the persecution of Cuban financial transactions around the world, with no respect for the laws of third countries. Cuba cannot export or import products or services to or from the United States or use the US dollar in its transactions, including payment to international entities, said the minister and pointed out that the blockade is a hostile and unilateral act that must be ended, a discredited policy lacking ethical and legal ground as it has been proven by over 180 votes by UN member nations and statements by many heads of state and government, who participated in the debate. HAVANA, Cuba, Oct 30 (acn) Cuba rejected at the UN General Assembly on Tuesday the groundless justifications put forth by the United States regarding its over-50-year economic, commercial and financial blockade of the island, which was once again overwhelmingly condemned by the International Community. Foreign Minister Bruno Rodriguez replied to statements made by US representative Ronald Godard who referred to the alleged US interest in supporting the Cuban people in meeting their aspirations. Rodriguez said that Godard lied by saying that the United States promotes human rights in Cuba, because the blockade is a massive and flagrant violation of human rights and an act of genocide. The Cuban foreign minister said that the US administration has no moral authority to address the human rights issue, given its military aggressions, which have killed millions of civilians, plus its secret jails, drone attacks, arbitrary detentions and torture of prisoners. Minister Rodriguez said that the US representative was lying when he said that his country provides Cuba with medical items and equipment and he challenged the US official to give examples at the assembly. The top Cuban diplomat denounced that the elements presented bby the US representative at the assembly are only related to the resources destined by Washington for its destabilization, subversion and change-of-regime policy. Rodriguez urged Washington to put down its double standard policy and to lift the blockade against Cuba, a criminal and hostile measure that was condemned by 188 UN member states on Tuesday. Bogotá, Oct 30 (Prensa Latina) Secretary General of the Colombian Communist Party Jaime Caycedo affirmed Washington is getting more and more isolated regarding the blockade to Cuba and taking into account the support showed by the international community to lift the sanction. Yesterday, the UN General Assembly approved with 188 votes out of 193 countries members, a draft resolution demanding the end of the economic, financial, and commercial blockade against the island, which was imposed by the US more than fifty years ago. This confirms the fact the world is willing to demand the end of the blockade to Cuba and it is further evidence of the US' isolation from the global community, he told Prensa Latina. For the 22nd time in a row, country member of the UN plenary supported categorically the lifting of the blockade, only rejected once again by the United States and Israel. This year Micronesia, Marshall Islands and Palau abstained from the vote. United Nations, Oct 30 (Prensa Latina) The US blockade on Cuba totally differs from the principles of the UN Magna Carta and the international rights, denounced the Community of Latin American and Caribbean States (CELAC) at the UN General Assembly Tuesday. Other organizations such as the Caribbean Community (CARICOM), the South Common Market (MERCOSUR) and the Organization of Islamic Cooperation, also raised their voices against the US government’s blockade to Cuba. On behalf of CELAC, Chile called its member countries to adjust their national and international actions according to the rights, obligations and principles of the UN Magna Carta, such as sovereignty, non-intervention and non-interference in the domestic affairs of the nations, the free trade and free right of navigation. The US blockade to Cuba enacted more than 50 years ago has caused severe economic losses to the people of Cuba, being felt in the most sensible sectors, said Chile in representation of CELAC. The member countries of the MERCOSUR also denounced the US blockade to Cuba violates the principles of the UN Magna Carta. Venezuela, in representation of MERCOSUR and its associated members, said the blockade also violates the equality principles among the nations. "The measures constitute a transgression to the right to peace, development and security, it is against the regulations of the multilateral trade system, and the nature of the World Trade Organization itself," said Venezuela at the UN General Assembly. For their part, Delano Bart, permament representative of Saint Kitts & Nevis in the UN, and also repressenting CARICOM and its 14 member countries, reminded the economic losses suffered by the Cuban population and government because of the US blockade, for 53 years now. Bart considered the social, economic and humanitarian cost of the US blockade to Cuba is becoming much more harmful, and highlighted the generosity and support given by Cuba to other countries when they have really needed it. The CARICOM delegate said this institution is based on principles such as the adhesion to the UN Magna Carta, multilateralism, sovereignty of the states and free trade, so this regional entity maintains its solidarity with Cuba and asks the US government to stop the blockade. The representative of the Organization for Islamic Cooperation at the UN, Roble Olhaye, also ambassador of Djibouti to the UN expressed the opinion of member states demanding the lifting of the United States blockade on Cuba. 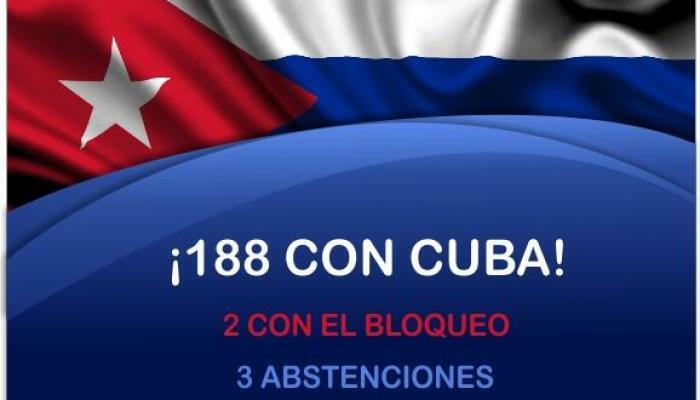 A total of 188 countries voted in favor of lifting the blockade against Cuba in 2012, while there were two votes against, and three abstentions. Cuba again Expresses Will to Serious Dialogue with U.S.
United Nations, Oct 29 (Prensa Latina) Cuba reiterated today before the UN General Assembly its will to go forward toward normalization of links with the United States, in a serious dialogue between equals and respect for its independence. Cuban Foreign Minister Bruno Rodríguez expressed before the UN session its stand, expression of its will of peace and respectful coexistence of the Cuban government. The dangers threatening the human existence are severe and imminent, so it is indispensable a deep change in the way of dealing and solving the problems and conflicts of the world, he said. Rodríguez detailed it is necessary to go through dialogue and cooperation, instead of selfishness and the philosophy of looting, to the use of force and coercitive economic sanctions who, silently, also hurt and kill. It is true that between both governments there are big differences -he said- but the only productive way is to find a civilized way to treat each other as neighbors, under the respect to sovereignty and self-determination. So, we would have to make dialogue, negotiation and even cooperation in whatever area is possible and convenient, to benefit both peoples and hemispheric relations, the minister said minutes before voting in the General Assembly to ratify for 22 consecutive years world rejection in that forum on U.S. blockade. Cuban minister Rodríguez said the bilateral approach can be achieved and is useful, as the recent resumption of migration talks and postal service, as well as contacts to respond to oil spills, marine and air search and rescue operations, together with air security. He stressed that president Barack Obama has the power to end the siege on Cuba. For the diplomat it is important to listen to the United States public opinion and Cuban emigrants, whose majority supports normalization of relations and are opposed to the blockade and the prohibition to travel to the island. Why not accept we are a nation and an independent State, equally sovereign. Wouldn’t it be better to pragmatically renounce to ideological obstinacy, inherited from the previous two generations of US politicians, he sentenced. Rodriguez denounced before the Assembly the worsening of unilateral sanctions and the human damage caused by the blockade, which he described as genocide.